What's inside can save you thousands of dollars and reduce your student debt! College costs have risen 1000% in the last three decades. The average student graduates with over $25,000 in loan debt. For many of us, if we can’t find a way to cut the cost of college, we may not be able to go to college at all. The good news is that you are not helpless: there are many ways to lower the cost of your degree. Brought to you by StraighterLine, a leader in providing affordable, flexible, self-paced online college courses for transfer students and adult learners. 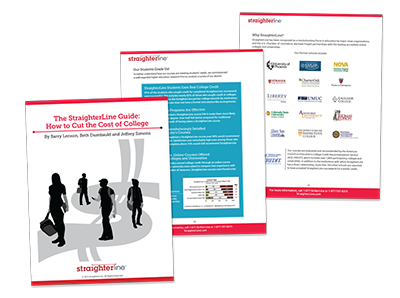 You can now download and enjoy The StraighterLine Guide: How to Cut the Cost of College. A problem occurred processing your request. Please try again.